The Three Rs: Rants, Raves and (Occasional) Reflections: My Mind Wandered...And Still Hasn't Come Back! All my life, people have told me how smart I am. When I was having trouble in school, Mom asked my guidance counselor if I had a learning disability. "Not at all," he assured her. "She could make straight As if she made the effort. Your daughter is bored. She's smart and she has a photographic memory. She picks up things much faster than her classmates, and gets restless when the teachers have to spend the time normally needed for the kids to learn. Because she's bored, she cuts class and acts out." I ended up quitting school. I think they were secretly happy to see me go. In the hospital following my first head injury, my doctor came into my room one day and announced, "I have a surprise for you. You're going to college." "I have a surprise for you," I told him. "I didn't finish high school." All the effort I'd put into going over the wall, and here was this guy wanting to send me back? No way! These days, there are courses to be taken before taking the GED exam. I never took any classes, just the exam. It wasn't that difficult. I left St. Louis University with one year to go to get my degree. Why? Bored again. I just don't do well in a classroom environment. I see Collin taking his courses online and wish I'd had that option. I might have actually finished what I started. I've never felt all that smart. I've certainly made some stupid decisions in my life. But then, intelligence and common sense don't always go hand-in-hand. Dad used to say smart people know they don't have all the answers, while idiots are too stupid to know they don't know everything. Sometimes, emotion overrides intelligence. Sometimes, pride gets in the way. Pride can be a dangerous thing. I speak from experience there. But that's not what today's post is about. Nope, today, I'm writing about my latest screw-up. I've been a writer--professionally--for thirty years now. I've written sixteen published novels. By this time, I should know the drill, right? Write, rewrite, revise, edit, proofread--I'd done it all with each book. Since signing with Creativia, we've already prepared two of my books for re-publication. Yet when I received the proofread copy of The Unicorn's Daughter a few days ago, as I went over it, I was surprised to find so many words in red. Why were they in red? Was something wrong with the file? I quickly emailed my publisher. As I waited for his response, it was pointed out to me that the red words are words that had been changed. They were in red so I could find them! I've been doing well on the new medication, but I'm not completely seizure-free yet. Sleep deprivation is a real seizure trigger. After a seizure, I'm often confused for a little while. I had gone over the proof copy after a seizure, knowing I should wait. As a result, I didn't recognize the red words for what they were. Hey, we all have our off days! Next time, grit your teeth and listen to your brain saying, "Wait! Wait!" no matter how much you want to forge ahead! That's the problem, Cheryl--my brain was giving me the silent treatment! Thanks for sharing this with us. Will you ever be, seizure-free? I think I will be, eventually. My case isn't nearly as bad as some I've seen in the online epilepsy groups. I don't have convulsive seizures, which is a blessing as far as I'm concerned. My problem involves hallucinations--visual, audio, olfactory. I smell things that aren't there. Do you ever use any of the stuff that you are smelling and seeing, for fun fictional bits? Yes. My male protagonist in Chasing the Wind is epileptic. I hate it when food I love smells so bad I can't eat it. Neat but I don't mean making a character epileptic but rather, using the things you see and smell for a non-epileptic character. My bad in not explaining myself well. Yes, you are lucky they aren't they convulsive kind that afflicted my brother. One of my blogs mentioned his problems, but had to change it for his family. For some reason, they never told their children. Perhaps it was the era they were born into and lived with the stigma that went with it then. Now they have all sorts of different terms for the different manifestations of epilepsy. Cheers for your progress! Oh boy, what a thing to deal with! Epilepsy as a condition has such different elements to how it behaves. It depends on what area of the brain is affected. Sometimes, I get so frustrated when I can't remember a word or how to do something...but eventually, it will come to me. I know what it's like to have seizures. I had them a lot as a child. Thankfully I outgrew it. I had no idea there were more than one type of seizure. I'm not even sure how many types there are. 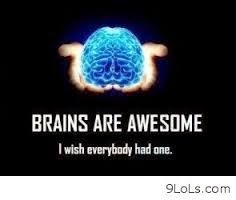 Mine are called complex partial seizures. It was! My face was as red as those letters when I realized what I'd done. I bet you could be teaching college classes if you wanted to remain bored all your life. LOL. I didn't like school either but for me it was the concrete. I'm a nature lover who enjoyed reading and writing poetry but school didn't inspire me at all. Me, a teacher? I wouldn't wish that on any student! I hated school. I don't like classrooms. I went to a 2-year college, got that degree, and tried the university. I've never been so bored in my life. And the professors are a bunch of puffed up air bags. Sorry you're having a set back. Hope things get better, Norma. Ok .. me dumb ! but were all the words in red because they changed them to a different word changing your writing ? Or were they misspelled words or wrong tense words ? Thank Goodness for Williams blog, so I could pop over to your blog. I don't know why your not coming through my e-mail ? I am so confused and sleep deprived too. Daughter is coming over Tuesday to help with my computer. Praise the Lord and pass the cookies. and all through University. I lived with my Mum and that helped quite a lot. We were poor but I think if I didn't have to work all the time I would have enjoyed school even more. I have to approve everything, even corrections, so they had everything in red so I could find them easily. Collin tried working full-time and going to school full-time. He was exhausted all the time. He wants to get his MBA, but he knows he can only do it online. Online is the best way. That wasn't around when I was in school. I just read your reply to PDP and I feel the same way. I don't have seizures but that is almost the way I feel. When they were looking for the aneurysm they found I had several micro strokes. Everyone my age has them but they have really affected the way I talk and remember.words It is so frustrating. I am happy your still working though. Never give up. I love learning new things, as long as I don't have to work too hard at it. I've never had a seizure, just lots of senior moments. I know those well, Karla! It's all good. I have those face-palm moments all the time. The older I get, the more I have. Good luck with the edits… not fun! My load has been lightened already. Creativia is dealing with my backlist, Collin is scanning the books that need to be converted for them, and that leaves me free to work on the new projects--and take my time with them! You are so hard on yourself Norma, you should chill a bit.. you are a brilliant writer, these little mishaps are nothing in the big picture. I think I get frustrated because it always came so easily to me--I wrote The Unicorn's Daughter in four months, and it required very little editing. I get distracted easily. I offered to read a paper Collin wrote for one of his classes. It took me three days to go over a three-page paper. I was off seizure medication for a long time about ten years ago. Because we were moving around a lot at that time, the neurologist hadn't been able to reach me with my test results, and I guess the damage was done. 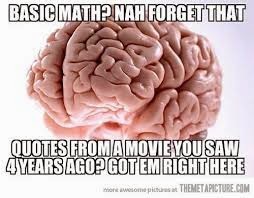 No meds, and a lot of stress (a guaranteed seizure trigger), and now my brain's fried. I go into detail about what happened and why in my memoir, but this is the gist of it. It may be a little frizzled Norma but there's no way your brain is fried! You sound like my neurologist. At my lowest point, I asked her if I could be developing Alzheimer's. She just looked at me and said, "You're way too sharp for that." But most days I don't feel sharp. I have all kinds of ideas but can't stay with anything longer than a blog post long enough to finish it. I found you. Your now on my yahoo page so I can read you. 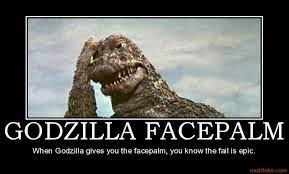 That's why I chose Godzilla for my facepalm moment! I knew you'd love it!